Ross & Cromarty Roots | Donald & Christina Macrae. In memory of/DONALD MACRAE/who died at Letterfearn/21 November 1906/and his widow/CHRISTINA MACRAE/who also died there/11 July 1950/aged 89. Picture Added on 27 January 2009. Donald Macrae was the son of Alexander & Janet Macrae of Wester Achnaturd/ Letterfearn, Donald was the brother of my Great Grandmother Kate B1841~1917, Kate M: 1862 Kenneth Macrae at Inverinate, their Daughter Christina B1868~ 1938 was MY Grandmother she married Hector Macdonald, their son Donald was my Father!! A HUGE Thank You to TINA Glen~ Riddell for the wonderful find & photo & to Ross & Cromarty Roots for their dedication in their search for our incredible Ancestors. Added by Flora Macdonald on 16 January 2018. 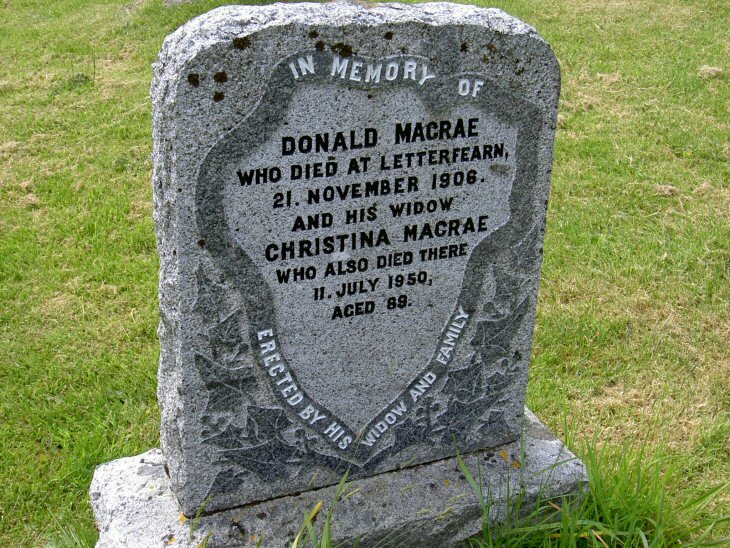 The tombstone was erected by the family of Donald & Christina of Letterfearn, wondering if there are any of their descendants still in the area at all ? Added by Flora Macdonald on 31 January 2018. Added by Flora Macdonald on 10 October 2018.